Soft, grey, rainy morning in the hills. My dog has decided there is no place more sensible than a duvet. Her nose emerges every now and then like a radar to figure out if her staff (ie us) is at hard work in the catering department. Then she buries herself again. A review of Atlas, meanwhile, in a Cleveland paper: "Roy's writing is nuanced and luminous, never hurried, leading the reader through the lush Bengali landscape and into the hidden terrain of desire and loss". Read the complete review here. The Folded Earth was reviewed too, in Outlook. "Roy joins Allan Sealy, whose elegiac The Everest Hotel also asks: is the way of life in colonial hill stations falling apart as they grapple with inept modernity?... As with An Atlas of Impossible Longing, Roy unravels the small-town terrain with certitude. At one level, her prose is a dirge for the Kumaon hills. At another, a Pickwickian humour infuses it with robust charm." What is on the work table right now though is book covers: I design book covers for our independent press, Permanent Black. 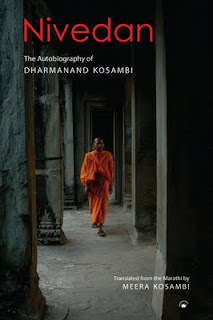 Here is the latest, for a brilliant autobiography of a Buddhist scholar.